With school holidays just around the corner, we have been asking friends for their top travel tips and who better to speak to and ask advice from than mum of two and founder of Content & Calm, Solvej Biddle. 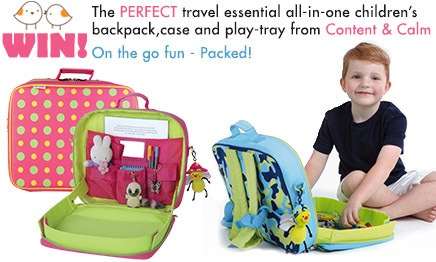 Content & Calm’s fabulous Travel Tray Kits – a Play Tray and Back Pack in one! When your baby is very young (before they start to crawl) they are at their most portable, their needs are reasonably predictable and they sleep a lot. 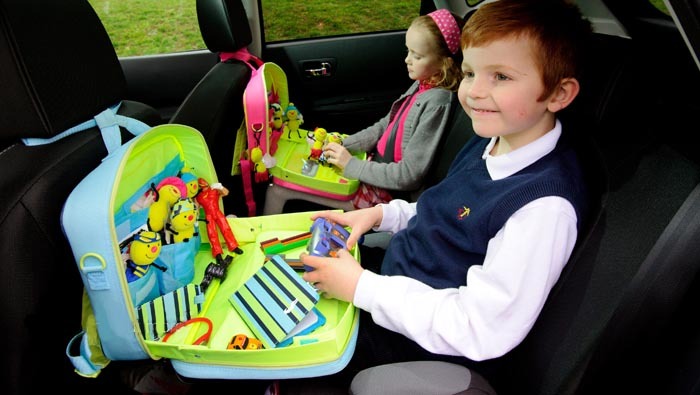 Perfect for long journeys so long as you plan as much of your journey time as possible around nap times, with regular breaks included around feeding times. Whilst this might sound obvious, planning and creating a master packing list for your children avoids last minute panic-packing – a strategy that always leaves you feeling you’re carting around a whole load of extra STUFF with at least one crucial item ending up home alone! As soon as your child is old enough to enjoy toys and books, their own backpack or TrayKit® can be a life-saver. If they are young, pack it for them with a mixture of familiar toys, paper, crayons but include some new things to make travelling exciting if you’re on a long trip. If your child is a little older (3+), encourage them to pack their own bag. They love to do this but I recommend a certain amount of adult supervision having checked my son’s bag and found it contained carefully packed train track but no trains. Older children also love audio books and will often be happily occupied on long journeys listening to favourite stories or songs. Once you’ve arrived, ensuring that they have an environment as familiar as possible can keep a young baby rested and happy. Think about how your baby’s going to get their sleep in the day and during the night.. I didn’t think about this enough our first trip away with Andrea Anna when she was a few months old and sleeping through the night. Unable to block out the light in our room, her daytime sleep pattern was soon in tatters she was grouchy and exhausted and so were we. Plus stumbling around in the dark trying not to wake her when we were sharing a room wasn’t great either. I ended up designing the Cot Canopy and the rest is history…! Remember what your baby will need to be happy and settled and chances are you’ll have a wonderful holiday – Enjoy! For more great tips visit the Content & Calm website. Content & Calm have kindly given us two of their fabulously innovative Tray Kits to give away – have a look at this great competition on Twitter – Just Retweet the competition tweet to enter!